We know that world clock understanding is compulsory for the ship driver. But for students of class 7 and above grade, it is very important to understand the world clock system, international time zone and international date time to score high in the examination of geography paper. Many student faces problem in solving the time problems in Geography. I will clear everything with the help of sketches and videos. World time zones: These are the international standard time zones which was agreed in 1884 in the International Prime Meridian Conference. The world time zone was divided into 24 standard time zones. Each zone is a zone of 15 (360÷24) degree longitude span . This was done to keep the uniformity of time at a particular time. Let us understand this mathematics. We know that each longitude differ by 4 degree to another longitude. So for 15 degree there is difference of 60 (15×4) minutes. Therefore it is clear that each time zone ranges 1 hour in terms of time scale and 15 degree in terms of angular scale . So 24 time jones is equal to 24 hours which is the time taken by the earth to rotates at its own axis to complete 360 degree. Suppose you travel from Greenwich towards East for 12 hours that means 180 degrees East and you stand there. Another person did the same thing but he travelled towards West of the Greenwich. Both of you will meet at one point. The trsveeled distance in time scale is 24 hours or 360 degree in angular scale. Therefore both of you have to change the date. The person travelling from Greenwich towards East will reduce his date e.g. If he was travelling on November 24 then he has to change the date to 23. The person who was travelling towards West; was travelling on November 22 . It is because the sun rises in the east so this man was already behind a day from the first one. Therefore he will gain a day while crossing the 180 degree longitude. He will change his date from 22nd November to 23rd November . Let us do an interesting practical. Suppose you're in India. And it is 8.43 AM on 3rd December 2013 . 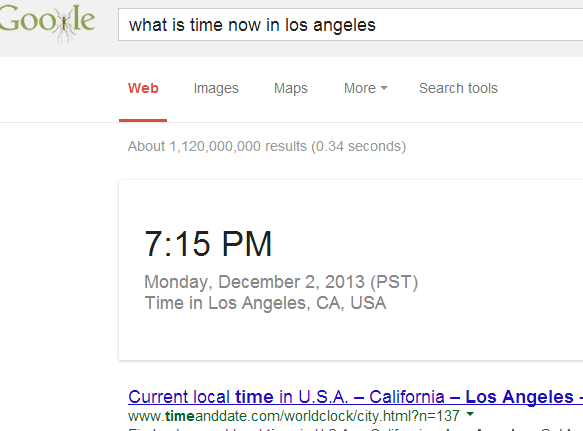 Google for real time clock for the keywords ' what is time now in Los Angeles' This result will show current time as 7:15 PM in Los Angeles ( 2nd December ) as shown in this Screenshot. The longitude of Los Angeles is 118.2500° W and that of India is 78.0000° E. Therefore total longitude difference is 118.25+78=196.25; and time difference is 785 minutes; which is about 13 Hrs difference. Let us solve few sums of Geography. I will give the solution in video and text both. To see these sums click here. watch this video and if you have any question then feel free to ask through contact box or this form.